Rooftoppers has completed over 75 million dollars worth of roofing projects since 1983. We are a dynamic company who has a history of doing things right in the midst of an industry who quite often displays a less than professional image. Why Should You Hire Rooftoppers? We believe a job worth doing is worth doing right and our core values serve to ensure our beliefs and goals from the start to finish of every project we are entrusted with. Our goal is to maintain quality, integrity, honesty and respect for our customers, as well as for each other. At Rooftoppers, we believe in leading by example and will never compromise on care and quality when it comes to doing what’s best for our customers. We also believe that growing personal relationships are what builds the foundation of success. Therefore, we strive to make sure every customer is a satisfied customer from the day they sign their contract and for many years to come. Your home’s roof will sustain years and years of unrelenting abuse from the elements as it’s constantly being pelted by wind, rain, hail, ice, snow and a multitude of other flying debris. So don’t trust your roof’s repairs or replacement to just anyone. At Rooftoppers, we use only the best materials available for every job we do. And we always perform our installs according to the exact manufacturer’s specifications. That means you will never have to worry about the risk of your warranty being voided because your install or repair wasn’t done right. Tile roofing materials are generally made from terracotta or slate, and sometimes materials such as concrete and plastic are also used, and there are even some that include a waterproof glaze. Fired roof tiles date back thousands of years and were once considered a cheap roofing solution. 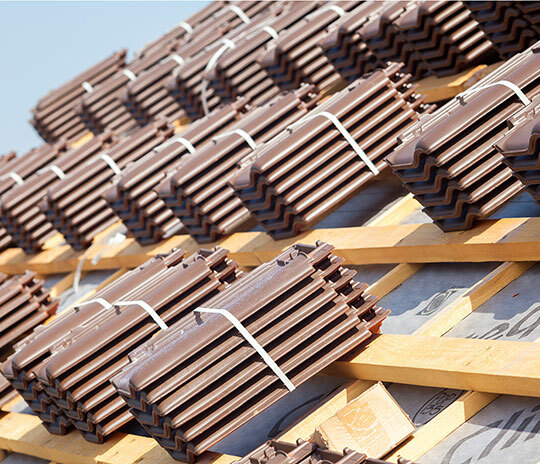 There are a wide variety of clay roofing tiles on the market. Most clay tile roofing products have a 100 year or more life expectancy which is why so many people choose this type of product for their home. Here are just a few of the clay roofing options that are available. A tile roof is extremely durable and very easy to maintain. However, before deciding on a tile roof, there are some things you need to consider such as the weight of this product. Tile is very heavy and therefore should only be used on a durable roof system that’s in good condition and can accept the weight of the tiles.